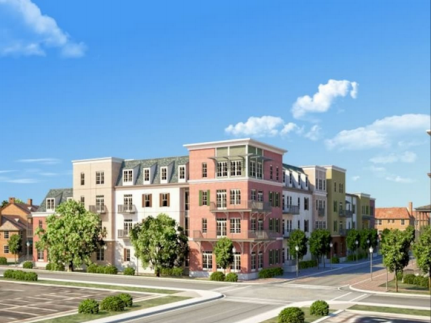 This illustration of Bienville Basin, which has appeared in news stories about the development, was included in an Airbnb listing. Bienville, located on the site of the Iberville public housing development, is being redeveloped with the help of taxpayer subsidies meant to expand affordable housing. Vacation rental services like Airbnb say they offer an authentic experience, a chance to live like locals. In New Orleans, where rents have outpaced wages over the past decade, that means tourists can rent an apartment in a development built with tax dollars for affordable housing. The Lens found nine rental listings that appear to be located in developments that received city funding to offer affordable housing. About half appear to be in a mixed-income development located at a former public housing site. Though it’s a booming business, short-term rentals are illegal in New Orleans. City law prohibits rentals of less than 30 days in most of the city (60 days in the French Quarter). But the city has rarely enforced the law. The New Orleans City Council is set to vote on legalizing and regulating such rentals before the end of the month. Much of the debate centers on whether short-term rentals are making housing too expensive. Airbnb hosts often offer an entire home or apartment; critics say that reduces housing for residents and drives up rents. Since Hurricane Katrina, most of the traditional public housing in New Orleans has been systematically demolished and replaced with mixed-income developments built with a combination of public and private funds and run by private companies. Public funds come in the form of loans and federal grants that are often passed through local and state government. In exchange, developers reserve a certain number of units for public housing or “affordable” housing, which is rented below market rate for people who meet income requirements. Most of the listings were for an entire apartment. This doesn’t mean that tourists are recovering from nights on Bourbon Street in low-income housing. The developments have a mix of market-rate apartments, affordable housing and, at Bienville Basin, public housing. Eric Bay is president of the Alliance for Neighborhood Prosperity, an ardent advocate for short-term rentals. He said Airbnb doesn’t belong in developments subsidized by affordable housing programs. Bay said his group has proposed an occupancy tax on short-term rentals that would be earmarked for affordable housing. We looked for listings on Airbnb and VRBO.com, a similar service, that were located near properties built or renovated with HOME Investment Partnership funds. Airbnb doesn’t provide exact locations of rentals, but it places them in the area. In a few cases, it was easy to determine where the rental is — one listing said it’s in Bienville Basin and another included a developer’s illustration of the complex. We identified some properties because the hosts provided photos of the exterior of their buildings or interior photos that showed nearby landmarks. We also compared interior photos to those shown on the developments’ websites. We sought comments from all the hosts, but none agreed to any interviews. In most cases, Airbnb hosts are identified by first name only. The photo on the left appears to show the view from the balcony of an apartment offered for rent on Airbnb. The photo on the right shows the view from the sidewalk. The buildings on both sides of the street are part of Bienville Basin, which is partly funded by taxpayer money meant to expand affordable housing in the city. In 2011, the city and the Housing Authority of New Orleans announced a redevelopment of the Iberville public housing complex. The project was estimated to cost $600 million — a mix of private and government funding, including Community Development Block Grants and HOME funds. Bienville Basin opened last year with 227 units, more than half of which are public or affordable housing. One Airbnb host, Gavin, had three listings that appeared to be for the same apartment (two for single rooms and one for the whole place). He has 52 guest reviews. Gavin declined to speak on the record, and he removed his listings after we contacted him. Gavin said he doesn’t live in Bienville Basin, but no buildings look like his listing in the area he claimed to live. One of the photos of his apartment was remarkably similar to one on the Bienville Basin website. Another was an illustration of the development that has appeared in news stories. The photo on the left was included in an Airbnb listing in Gert Town. The photo on the right is from the Blue Plate Artist Lofts website. An apartment offered by someone named Rene shows a kitchen with the same construction and furnishings as a sample unit posted on the Blue Plate website. Rene had 22 reviews; he removed his listing after we contacted him. The other host changed her profile name and photo, and removed photos of her apartment, after we sought a comment from her. Left: An Airbnb photo shows the kitchen of an apartment listed for $300 a night. Right: A kitchen in The Muses Apartments, located in Central City. The host, Senai, told The Lens that the apartment has never been rented through Airbnb. “I keep forgetting to take the ad off,” Senai said in a message sent through Airbnb’s site. The listing was soon removed. An Airbnb host posted the top photo in offering his apartment for $127 a night. The bottom shows the house, located at 1839 Carondelet St. It received city funding for affordable housing. This listing advertised that it’s located in the “most affluent location of NO.” There weren’t any reviews from guests. The house is owned by First Emanuel Baptist Church, which is a couple of doors down the street. The renovation grant went to Greater New Orleans Rehabilitation Corporation. Both are run by the Rev. Charles Southall. He said in a phone interview that he had checked into the matter and was planning to evict the tenant. Bay said renters who use Airbnb aren’t welcome in the Alliance for Neighborhood Prosperity. The city’s Office of Community Development monitors properties that are funded with HOME funds to make sure they comply with certain terms. The city typically requires a certain number of units to be rented below market rates to low-income tenants for up to 20 years. Office of Community Development Director Ellen Lee did not respond to requests for comment on this story. HRI Management, which manages Blue Plate and Bienville Basin, told The Lens that those leases don’t allow tenants to rent their places to others. Tenants who break that rule that are put on notice that they could be evicted if they don’t stop. The residents at Blue Plate and Bienville Basin were notified Wednesday that they had to stop renting, said David Abbenante, president of HRI Management, in a written statement. He added that the company has dealt with similar situations in the past. One happened a few months ago at River Garden Apartments, a mixed-income development with some public housing on the site of the former St. Thomas public housing complex. Staff noticed unusual traffic, he said, and told the tenant to stop renting to tourists. Carolyn Mayo, an HRI spokeswoman, told The Lens that the unit wasn’t a public or affordable housing unit. Lesley Thomas, a spokeswoman for the housing authority, said tenant confidentiality prevented her from commenting on whether the agency knows of short-term rental activity at its properties. The Greater New Orleans Fair Housing Action Center opposes vacation rentals for entire homes, but the head of the group said she didn’t know enough about these cases to comment on them. The city will post names and addresses online.